Every day in Marion County, people of poverty face special challenges for sheer sustenance and personal safety. This sobering reality is underscored by the fact that poverty is on the rise and Marion County’s poverty rate is increasing faster than the rate for both Indiana and the US. The faces of poverty surround us: they go to our area schools, attend the same churches, and often just live down the street from us. Most startling is that nearly 33% of all children in Marion County under the age of 18 are in poverty. Which begs the question… what can I do? There is room at the table of help for everyone. An abundance of volunteer opportunities exist. Donations of used appliances and furniture are needed. Monetary donations support the the many works performed by SVdP to address community needs. The call for help and the fulfillment of that need speaks to the heart of Jesus’ message: “Do unto others as you would have them do unto you.” Your involvement will never be more important — or rewarding. Our desire to help the less fortunate depends on your support. Click the blue button below to make a one-time gift or set up recurring donations. You can also download the form below to send in your donation via US mail to 3001 E. 30th Street, Indianapolis, IN 46218. Please make checks payable to Society of St. Vincent de Paul. For questions regarding donations, please call (317) 924-5769. Or, download form to pay by mail. If you wish to discuss estate planning, please call: (317) 921-1405. Our 30th Street Pratt-Quigley Client Choice Food Pantry serves all of central Indiana residents in need. 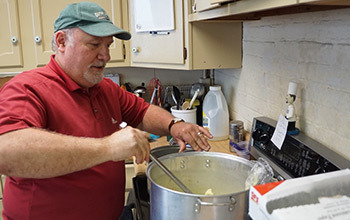 Responding to God’s call to “Feed the Hungry,” we strive to manifest God’s love by providing a selection of food and self-help programs to those in need in an atmosphere of dignity and respect for client and volunteer alike. Sign up for a WEEKDAY at 3001 E. 30th St.
Sign up for a SATURDAY at 3001 E. 30th St.
All volunteer opportunities at 30th Street can be found by clicking one of the buttons above. Should you need information on scheduling groups, please contact Darlene Sweeney, Volunteer Coordinator, darlene.sweeney@svdpindy.org. Individual volunteer opportunities at the Distribution Center can be found by clicking one of the buttons above. 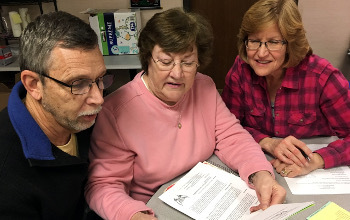 Should you need information on scheduling groups, please contact Darlene Sweeney, Volunteer Coordinator, darlene.sweeney@svdpindy.org. 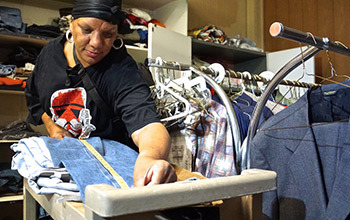 The Homeless Ministry (open 9:00 till noon on Wednesday and Saturday at the Distribution Center 1201 E. Maryland St.) is a program to help the homeless find sustaining employment through developing resumes, conducting job searches, housing research, and accessing needed social services. The Holy Cross SVdP Conference is asking for donations of used bicycles to help those in need with no means of transportation. Bicycles needing repair are also welcome. We also need helmets, ponchos, backpacks, bicycle locks, and reading glasses for this program. 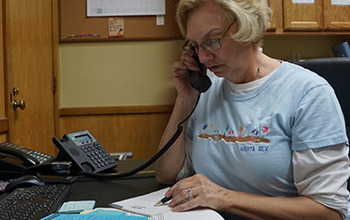 Our Telephone Ministry involves answering phone calls on your own home phone – however, your phone number will be blocked so that callers will not be able to see your personal phone number. You will take calls from people in need of assistance . Comprehensive training will be provided. Your donation of time to the Mission 27 Resale Store allows us to sell good things for a good purpose. 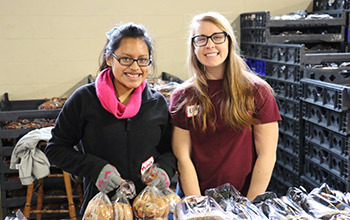 Named in memory of St. Vincent de Paul’s feast day, proceeds from Mission 27 are earmarked for bettering the nutritional offerings of the food pantry, and helping underwrite the costs associated with our Changing Lives Forever program. Many volunteers are needed! Mission 27 is located at 132 Leota St., Indianapolis. Our requests always exceed the number of drivers available so your help is valued. 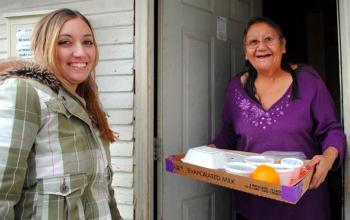 We recommend each driver go out with a helper as they deliver food to 5-7 people. This is a wonderful ministry for couples to do together and generally can be completed in a couple of hours. Click the button below to find a volunteer form that will put you in contact with our volunteer coordinator. The Conference is the basic unit of the Society of St. Vincent de Paul, and this is where the strength of the Society lies. The mission of the Conference is the mission of the Society: to join together in a bond of friendship, and to grow spiritually by offering person-to-person service to those who are needy and suffering. 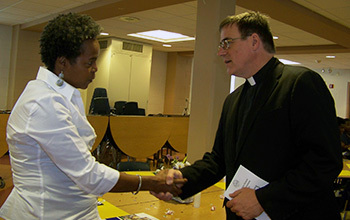 The Conferences operate within the Catholic parishes and provide its members with opportunities to minister to those in need on a person-to-person basis through home visits, and to serve in its special projects. The Conferences have a goal of creating “Neighborhoods of Hope” by caring for those people in our immediate areas of the community. The Society’s motto is “No work of charity is foreign to the Society.” For more information on St. Vincent de Paul Parish Conference Membership, call your local Catholic Parish and ask the Parish Secretary for the name and contact information for the President of the St. Vincent de Paul Conference. To schedule a Saturday morning pick-up of usable major appliances (electric ranges, washers, electric dryers and refrigerators—(even if needing repair), furniture, lamps and other basic household items, complete our on-line form by clicking on the… SCHEDULE A PICK UP… box below, or call our Donation Line: 317-687-1006. Clothing, linens, pots and pans, tableware, dishware, glassware and books are accepted if accompanied by other major items. Adult bicycles are also accepted (even if needing repair), along with helmets, locks, backpacks and reading glasses. Lead time on pick-ups is typically up to 2 weeks. You will be notified promptly of the pick-up date after we receive the submission. Please note that we do not accept used mattresses, box springs or bed frames at this time. Donated items are always welcome if delivered directly to our Distribution Center at 1201 Maryland St. between 8:30 AM and 4:00 PM Monday – Saturday. Receiving docks are at the back (south) side of the building fronting on Georgia St. Thank you for your generosity, and for making it possible for those who have few resources to get a second life from your still-usable items. Please keep in mind we are seeking basic household items that are in good enough condition to give to people without resources to purchase them. 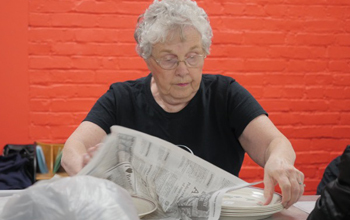 Torn, broken or dirty items, although offered to St. Vincent de Paul in good faith and good intent, will be declined. Unfortunately, we cannot accept every donation. A list of items we cannot accept is provided here. As a resource for you, a recycling link is provided for you to arrange the disposal of items that SVdP cannot accept. Please also note, The Bally Foundation, distributes Durable Medical Equipment (walkers, crutches, bath stools, etc.) at no cost to individuals. The Bally Foundation can be contacted via email , or phone at 317-626-0782. A vehicle donation program exists, and donated vehicles do not have to be in working order. Please click on this link to review program details if you’re interested in donating a vehicle. You can also call 800-322-8284 for more information. If any groups would like to conduct a Food Drive to support the 30th Street SVdP Food Pantry, please send an email to info@svdpindy.org or call (317) 924-5769. Generally, we have an ample supply of canned vegetables obtained from food drives in November and December. Large food drives conducted by Catholic High Schools provide the majority of this inventory. All donations are appreciated, but if possible, please solicit the specific items shown at the right which are usually in short supply. Note that any food brought directly to the Pantry helps avoid the fees charged by other food sources. 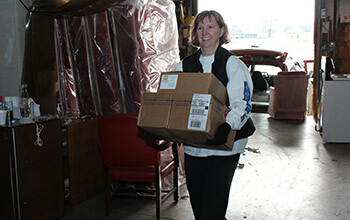 Of course, monetary donations are always needed to supplement food supplies. This allows SVdP to purchase needed products at a negotiated reduced cost from vendors. Please mail contributions to 3001 E 30th Street, Indianapolis IN 46218. If the Church fails to put the poor at the center of its ministry, we fail to understand the message of Christ.